The girls and I are off to "Little Flowers" for the evening! They have been so excited all day long, and have been finishing up a few of their assignments, including memorizing the bible verse of the month, as well as the Act of Faith. (Which are both proving to be very challenging for Chiquita, but she is trying!) They even did a little bit of coloring in their Member's Guide. Unfortunatley, the rest of the girls books have still not arrived, but from what I've been told, they are on the way. Watch them arrive tomorrow! :) Oh well, it is still going to be a fun night! I'm sure I'll be posting pictures soon! Have a great evening everyone! "St. Therese, you who are called the Little Flower, pray that I may always live as a good child of God. May I always do the little things of life extra well for the love of God. 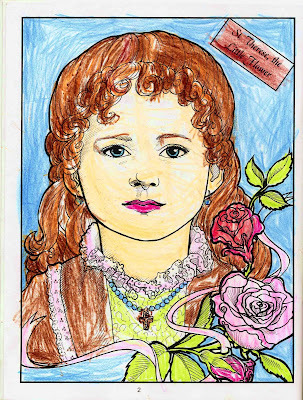 St. Therese, you love flowers and you wanted to give to Jesus the flowers of many, many souls. Now that you are in heaven, let fall upon earth a shower of roses by your prayers. Bring many more souls to Jesus. Pray to the Mother of God for us that she will smile on her children here on earth. Amen." Twinkle Toes, you are an amazing little artist!! Your picture is beautiful, just like you!! Hey, how do you get those little hearts up there? "For St Therese *heart*"? Oooohh...how sweet! I just love that picture! What a beautiful piece of artwork. You are setting such a good example for your children in all that you do at home with them. Keep up the good work! You are a wonderful family. Twinkle Toes loved hearing your comments! She was very excited to have me post her picture! So thank you!! It has been awhile since I checked in and just wanted to say Congrats to you and your husband and children. What wonderful news!! I will say a prayer for you and your baby. I am so excited for you. Blessings! you, your husband and God make beautiful babies! Twinkle Toes, you are one great artist!! !